Summary and Definition: The Bay of Pigs invasion occurred on April 17, 1961, when 1400 CIA-backed Cuban exiles launched a botched invasion at a beach on the south coast of Cuba called the Bay of Pigs. Plans for US backed invasion of Cuba was initiated during the presidency of Dwight Eisenhower and implemented during the Kennedy Administration. The Bay of Pigs invasion was sparked when Fidel Castro nationalized all American companies in Cuba and the USA responded by stopping imports of Cuban sugar and all aid to Cuba. Fidel Castro turned to the USSR for a new trade agreement and help and became affiliated to the Communists. The United States were horrified and devised a plan, using anti-Castro exiles to overthrow Castro and establish a non-communist government.. The CIA funded, armed, trained and transported 1,400 men to invade Cuba. The invasion force landed at the Bay of Pigs but the invasion ended in disaster when the majority of the invasion force were captured. President Kennedy was humiliated and had to negotiate a deal with Fidel Castro to release the prisoners. The Bay of Pigs invasion led to the Cuban Missile Crisis. John F Kennedy was the 35th American President who served in office from January 20,1961 to November 22, 1963. One of the important events during his presidency was the Bay of Pigs Invasion. Fast, fun facts and Frequently Asked Questions (FAQ's) about the Bay of Pigs Invasion. Bay of Pigs Invasion: Why is it called the Bay of Pigs? The Bay of Pigs Invasion is called due to a mis-translation from Spanish to English and the interpretation of its meaning. In Latin America the Bay of Pigs Invasion Invasión de Bahía de Cochinos or Batalla de Girón. The village of Girón, located near the Bay of Pigs was named after the notorious French pirate Gilberto Giron (c.1604). The Spanish term 'Bahía de Cochinos' translates to the 'Bay of Swines' but this is in reference to the pirates and smugglers who frequented the area who were referred to as "foul-mouthed rogues" or "dirty pigs". Bay of Pigs Invasion Facts - 1: The Bay of Pigs invasion occurred on April 17, 1961, when 1400 CIA-backed Cuban exiles launched a botched invasion at a beach on the south coast of Cuba called the Bay of Pigs. Bay of Pigs Invasion Facts - 2: The island of Cuba is located just 90 miles away from the shore of Florida and was where many Americans held lucrative business interests especially in the sugar and tobacco industries. Bay of Pigs Invasion Facts - 4: Once in power, Fidel Castro infuriated the Americans by nationalizing all American companies in Cuba. Bay of Pigs Invasion Facts - 5: In response to Fidel Castro's action the United States stopped all imports of Cuban sugar, and all aid, to Cuba. Bay of Pigs Invasion Facts - 6: Fidel Castro turned to the USSR for help, and the Soviets signed a Cuban-Soviet trade agreement on February 13, 1960 to buy 1 million tons of Cuban sugar each year. Other communist countries behind the Iron Curtain, the 'Satellite nations' of the Warsaw Pact, also made commitments to purchase Cuban sugar. Bay of Pigs Invasion Facts - 7: Under the strong influence of the Soviets, Fidel Castro became a Communist, to the utmost horror of the United States. Bay of Pigs Invasion Facts - 9: The United States was embroiled in the Cold War (1945 - 1991) with the USSR who were determined to assert their influence over smaller nations and to adopt communist governments. The United States strongly adhered to the US Policy of Containment to restrict the spread of communism by diplomatic, military and economic actions. Bay of Pigs Invasion Facts - 10: The relationship between Cuba and the United States deteriorated and by March 1960 President Dwight Eisenhower approved a CIA plan to organize, train, support and equip an invasion of Cuba by anti-Castro exiles. The following fact sheet continues with facts about Bay of Pigs Invasion. Bay of Pigs Invasion Facts - 11: John F. Kennedy was elected in November 1960 as the 35th president of the United States and his administration inherited the invasion plans when he assumed the presidency. 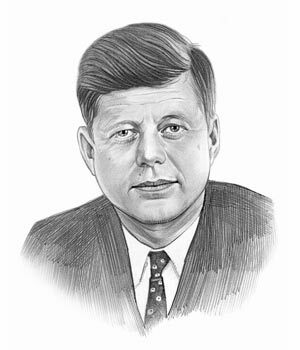 The plan, with President John F. Kennedy's knowledge, was to overthrow Fidel Castro and establish a non-communist government friendly to the US. Bay of Pigs Invasion Facts - 12: By early 1961, the Soviets had supplied Cuba's army with tanks, howitzers, artillery and small arms and supplied the Cuban air force with bombers, fighters and jets. Bay of Pigs Invasion Facts - 13: Fidel Castro and Che Guevara, a Cuban hero who had been a major figure of the Cuban Revolution, had anticipated an invasion. News of the planned invasion had been leaked and information had been picked up by the Cuban secret intelligence network and KGB agents. Bay of Pigs Invasion Facts - 14: Rousing the Cuban populace, Che Guevara stated that "all the Cuban people must become a guerrilla army, each and every Cuban must learn to handle and if necessary use firearms in defense of the nation." The Cuban militia were armed and prepared for an invasion. Bay of Pigs Invasion Facts - 15: The CIA funded, armed, trained and transported 1,400 men to invade Cuba and attempt to overthrow Fidel Castro. Bay of Pigs Invasion Facts - 16: The invasion force landed at the Bay of Pigs on April 17, 1961. Bay of Pigs Invasion Facts - 17: The invasion force expected to be actively supported by the American military, but significant support never materialized. The invasion force also expected that the people of Cuba would rise up in support of the invasion and join the anti-Castro exiles in overthrowing the dictator Castro and his government. Bay of Pigs Invasion Facts - 18: The Bay of Pigs invasion was a disaster. The expected support and uprising by the Cubans never materialized. 1200 of The invasion force were overwhelmed by Cuban troops and local militia. By April 20, 1961 and 1200 invaders were forced to surrender. The captured troops were publicly interrogated and incarcerated in Cuban prisons. Bay of Pigs Invasion Facts - 19: President Kennedy, embarrassed and humiliated, had to negotiate a deal with Fidel Castro to release the prisoners. Bay of Pigs Invasion Facts - 20: Following the Bay of Pigs Invasion on April 17, 1961, Fidel Castro formally declared Cuba a socialist state on May 1, 1961. On December 2, 1961 Fidel Castro proclaimed himself a "Marxist-Leninist" in a televised speech on December 2, 1961. Bay of Pigs Invasion Facts - 21: The Bay of Pigs invasion led to the Cuban Missile Crisis (October 14, 1962 – October 28, 1962), that brought the world to the brink of a Nuclear War. The article on the Bay of Pigs Invasion provides detailed facts and a summary of one of the important events during his presidential term in office. The following John F Kennedy video will give you additional important facts and dates about the political events experienced by the 35th American President whose presidency spanned from January 20,1961 to November 22, 1963.